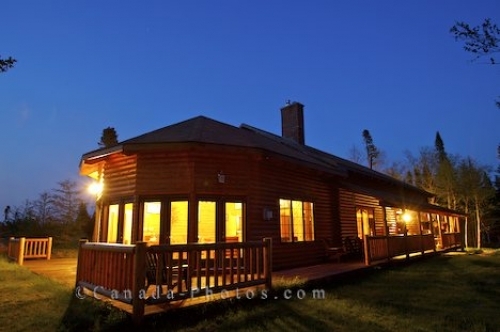 The true wilderness of Main Brook, Newfoundland surrounds the Tuckamore Lodge and at night fall, the building shines with a golden glow from the interior and exterior lights. As night settles in around the Tuckamore Lodge in Main Brook, Newfoundland, the wilderness surrounding these accommodations is illuminated as the yellow glow from the lights are displayed. The Tuckamore Lodge is located in the middle of no man's land where peace and serenity surround you but it is only a short distance away from some of the main tourist attractions such as Gros Morne National Park, the viking sites, spectacular fishing locations and iceberg and whale excursions. At the Tuckamore Lodge visitors with a desire for nature, history, culture and adventure will fully enjoy their stay in these luxury Scandinavian styled accommodations. There are eight guests rooms at the lodge all having their own bathrooms, beautiful furnishings and comfortable beds with a lounge, dining room and wilderness exterior shared by all. Picture of the night lights glowing across the wilderness from the Tuckamore Lodge in Main Brook, Newfoundland in Canada. Tuckamore Lodge, Main Brook, Viking Trail, Trails to the Vikings, Grenfell Trail, Great Northern Peninsula, Northern Peninsula, Highway 432, Newfoundland, Canada.